In an increasingly technological world, attacks on our safety are becoming a bigger and bigger threat. That means, in places like New York City, our buildings and facilities are at risk. Just as advances in technology have made different types of attacks more prevalent through the availability of resources, they have also made security and access control much more efficient. The days of using a paper log and a lone security guard at your front desk as your only means of facility management and safety are outdated and no longer efficient. Luckily, with technological innovations like SV3® from Building Intelligence, you can take your visitor management system to the next level. That level just happens to be in the cloud. Having a cloud-based visitor management system gives you all of the control you need to properly manage and protect your facility, from office buildings to loading docks to vehicle access and more. A digital, cloud-based system allows you or your facility’s tenants to eliminate the need for paper logs, which can be messy, hard to track, unreliable, and illegible. Not to mention they can be lost, damaged, or manipulated. Storing your system’s information in the cloud allows it to be managed and organized on an easy-to-use system that can only be accessed by those with proper authorization. You can utilize self check-ins, properly track your visitors, receive custom notifications when a visitor checks in or checks out, and more. You can even manage your system on your mobile device or tablet, all with automatic system updates provided by your visitor management system company. Are you doing everything that you can to secure your building? If you haven’t moved to a fully integrated, cloud-based access control solution like SV3®, then you might not be. Here are some reasons why you should make the switch from outdated logs to a more advanced facility management system. Paper logs are problematic and outdated for a variety of reasons. First of all, paper logs are simply not secure or safe. Anyone from unauthorized employees to improperly vetted visitors can look at the logs to see who has been in and out of your facility, compromising confidentiality and sometimes even security. Furthermore, visitors can’t always be trusted to properly fill out a paper log with accurate or even legible information. Not knowing exactly who is coming into your building, or having a way to verify their identity, creates a gap in your facility’s security. Paper logs also get filled up, damaged, torn, and even lost before the information gets properly transcribed. Simply put, this method is outdated and unreliable. With a cloud-based visitor management system, you can properly manage all of your visitors, schedule their visits, create custom photo I.D. badges with check-in and check-out times, and track them from anywhere in the facility. This gives you and your tenants the peace of mind they deserve in this often dangerous world, allowing them to know exactly who is coming into your facility, when they are coming, and how long they are coming. Cloud systems allow you to manage all of your visitors’ information in one easy to use application, eliminating human error and ensuring that no one can access your information without the proper authorization. Just enter the information, scan the card, and that’s it. Your system will do the rest. Cloud-based visitor management systems also allow you to get custom notifications whenever a visitor checks in and checks out. This means you can properly manage your building office, school, manufacturing plant, construction site, loading dock, and other facility from anywhere while knowing who is inside at all times. Whether you’re sitting at your desk or accessing your cloud system remotely, you can get an alert when a visitor checks in, when they’re scheduled, and when they’re checking out so that you can know who’s on-site, who is due on-site, and who has been on-site, which can be a crucial part in your security operations. SV3® even gives you the opportunity to pre-register and schedule authorized visitors so that you can track their entry and exit. Not only will this give you added security, but it will give your visitors a peace of mind knowing they’re stepping into a thoroughly vetted facility. Long lines and queues forming in a crowded, loud lobby not only hamper your building facility’s production, but also create an increased security threat. Those things can be eliminated with a cloud-based visitor management system like our SV3® solutions, which can be fully integrated onto a fully functional kiosk for self-registration and service. Self check-in kiosks allow your facility security to be more efficient, giving visitors the ability to register their information to be stored in your system, scan their custom QR code for access into the building, and automate the overall security process with the cloud’s digital log book. These cloud-based self check kiosks promote efficiency for visitors and your security personnel, allowing you to cross-check vital visitor information and create watch lists and VIP lists. This can streamline the overall security process by making sure no one can get through without authorization from the kiosk and even help you save money on security personnel and damage costs that could stem from an attack by an unauthorized visitor. Kiosks are only one way you can use your cloud-based visitor management system on a digital device. Building Intelligence access control systems like SV3® can be fully integrated to run on mobile devices, and are compatible with iOS, Android, and Microsoft tablet operating systems. Imaging being able to view and verify visitors, passengers, vehicles, schedules, and more all from one convenient mobile application. Mobile friendly visitor management systems allow you to check vital security information, view I.D. cards and driver’s’ licenses, capture a signature, verify license plates, and sens notifications through text or email all through the cloud. The security and safety of your facility can literally be in the palm of your hand with SV3® Mobile. 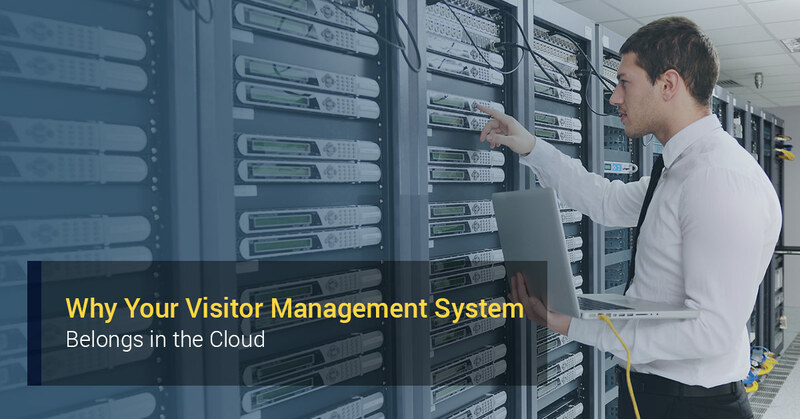 Last, but certainly not least, getting a cloud-based visitor management system eliminates the headaches and stresses of manually upgrading your devices, logs, and technology. SV3® applications automatically upgrade, giving you the most efficient and up-to-date technology available so that you can manage visitors, receive check-in and check-out notifications, view personnel records, manage your office-wide message board and networking services, and more all without a loss of performance or security. You’ll never have to worry about a lack of support, as all of our service and upgrades are provided through the cloud and the Internet. All told, using a cloud-based access control system, like the ones provided by Building Intelligence, is a tremendous step towards preventing terrorist attacks, thwarting would-be criminals, and ensuring all of your visitors are thoroughly vetted before entering your facility. Our SV3Cloud services are provisioned as Software as a Service (SaaS) and are available worldwide. We provide all of the necessary support and service you need to properly protect your facility, resulting in a decreased cost of ownership and securing your data in a private database for your needs. Contact Building Intelligence today to learn more about the benefits of the cloud and our visitor management systems.